The ruined engine house at Wheal Coates tin mine clings to a Cornish cliff top. I spotted the potential for a night image on a previous visit, noticing that the best aspect faces due north. 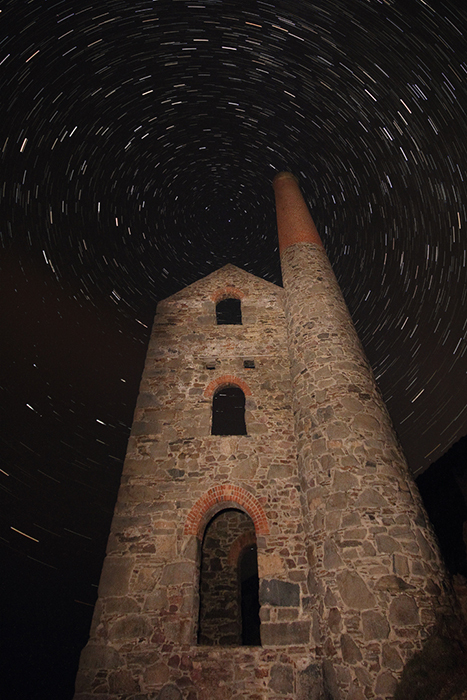 I set up with the North Star directly over the apex of the roof and made thirty 30 second exposures to record the movement of the stars over 15 minutes, lighting the engine house with my torch. On this remote Cornish cliff top, light pollution was not a problem but I was wary of stumbling over the cliff edge in the dark!